Young girls will love the vibrant colors and long hair that comes on this headband. It is perfect for Halloween costumes. Dress up as a cartoon character or be a rainbow unicorn! 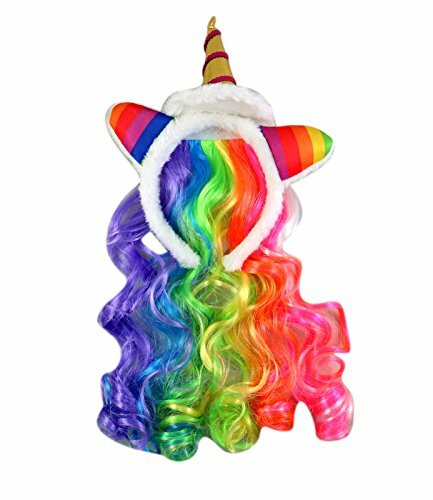 The headband features a gold horn, rainbow unicorn ears, and long rainbow hair on a white headband. Packaged so it is ready to be worn right after its taken out of the packaging. The headband will fit most heads, both children and adults. This piece is perfect for Halloween costumes. Dress up as a cartoon character or be a rainbow unicorn! If you have any questions about this product by Needzo, contact us by completing and submitting the form below. If you are looking for a specif part number, please include it with your message.